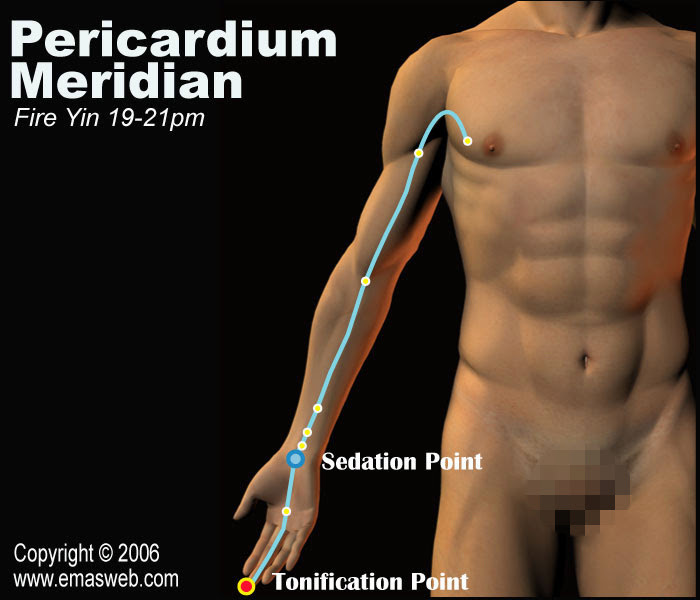 The Pericardium Meridian connects with the Sanjiao Meridian, with which it is externally-internally related. Based on traditional Chinese medical theory, symptoms of the Pericardium Meridian are related to an imbalance in the function of the heart and blood. Symptoms include pain in the heart region, chest fullness and oppression, palpitations, etc. Based on traditional Chinese medical theory, the heart stores the spirit and houses the mind. This means it manages mental and psychological activity. Diseases like manic-depressive disorder are also related to the Pericardium Meridian. In addition, swelling and distention in the armpits and elbows also shows problems of this meridian. As heart function is helped by the pericardium, the clinical symptoms and treatment are similar. Peak qi and blood flow in the Pericardium Meridian is from 7:00 pm to 9:00 pm. 1.Diseases of the chest and heart. 3.Diseases along the course of the Pericardium Meridian.